Choose a scale type such as a major, minor, etc. then set a root not of that scale by rotating the outer ring. The notes that make up of the scale can be distinguished by the color of its background. Also, a signature of the scale is showed at the center of the rings. A sound of the scale can be played by clicking a play button on the bottom of the screen. If one of the notes that are highlighted is touched, then a diatonic chord of which a root is the clicked note is set. A figure on the left is a case of D major scale. It represents that notes highlighted by a background color are a member of D major scale. 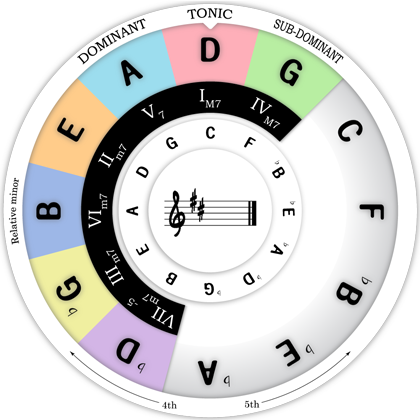 So, we can see some information at a glance that members of a D major scale are D, E, ♭G, G, A, B, ♭D, and D is a tonic, A is a dominant, G is a sub-dominant, and a relative minor scale of D major is a B minor. Choose a chord type such as major 7th, dominant 7th, etc. The root note of a chord can be set by ratating the inner ring. The notes that make up of the chord can be distinguished by the color of its background or its mark. A sound of the chord can be played by clicking a play button on the bottom of the screen. From the figure on the left, we can see easily that the IIm7 chord in a D major scale is Em7. Also, we can see some infrmation at a glance that the members of the Em7 chord are E, G, B, D.
When you want to find a scale of a music, set the type of a scale first, then rotate the outer ring until every chord/note is highlighted. Or in contrary, you can start it by setting the root note first. Like the figure on the right, inner ring can be replaced to a ring of key progression instead of a chord ring. 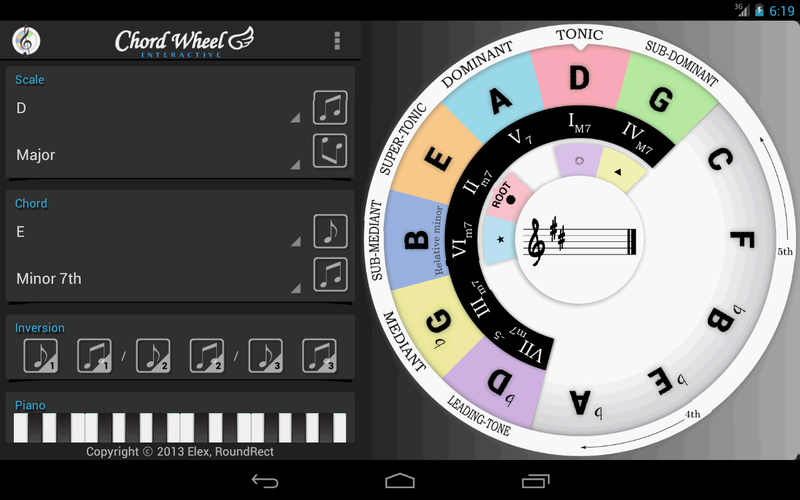 This feature is really useful when transposing. For example, in case of transposing a D Major scale to C Major scale, set the outer ring to D and the inner ring to C, like the figure on the right. Then, we can see that an A chord of a D scale have to transposed to a G chord in a C scale, and an E chord of D scale to D chord in C scale. Following scale types are available. 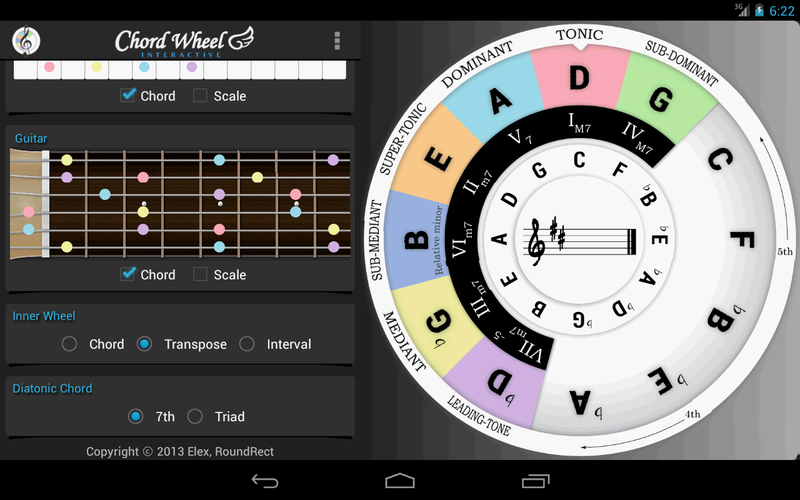 In a lite version, a Major and a Natural minor scale are available only. Following chord types are available. 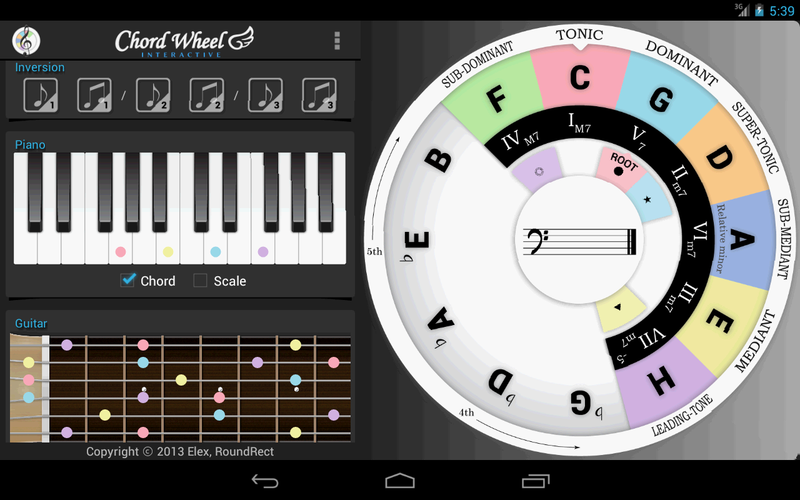 In a lite version, triads which are used to a diatonic chord of a major and a natural minor scale are available only.